The word iai 居合 has the idea of meeting an opponent that is attacking you. There is a slightly defensive nuance to this word. These arts start with the sword in the saya (sheath). Alternatively, it is called Battōdō 抜刀道 or Battōjutsu 抜刀術. Battō is pulling out the sword. In iaijutsu the techniques are centered around responding to an agression while your sword is in its saya, or deplying the sword to act agressively. There are some common main components to iaijutsu such as nukitsuke, kiriotoshi, chiburi and nōtō. The art of iaijutsu is commonly known around the world as iaidō. The question often asked is are iaido and iaijutsu the same? What is the difference between iaidō and iaijutsu? Iaido and Iaijutsu refer to the art of drawing the sword in attack or defense. The first difference to note is the semantic differences between dō and jutsu. Dō or michi 道 has the connotation of character refinement and spiritual training. In arts that use dō as their suffix, the main ideas are character refinement and aesthetics and generally not combative aspects. Jutsu 術 means art or technique. The styles usually using jutsu as their suffix are more concerned with combat effectiveness as their goal. The difference between dō and jutsu can be seen as semantics. People sometimes argue over something like Judo or Iaido having decent martial applications. The changes in names from Jujutsu to Judo, however, do have ramifications in the way the art was developed beyond its original intent as a dependable battlefield or warrior skill. The dō systems are sometimes erroneously looked at as inferior to the jutsu forms. Kendō while limited in its teachings for sword combat does have its own place in the spectrum of sword arts from Japan. It is not helpful to dismiss such a school as not worthy of swordsmanship training. Do not let the dō suffix always fool you into thinking the techniques are subpar. As well jutsu schools can also contain strong points of spiritual refinement and character development. So this idea between the difference of dō and jutsu can be a little complicated as you can see. If you are thinking, well this is a slippery slope to climb, it is indeed. You have to keep an open mind and not judge a book by its suffix. Japanese do use these words interchangeably as well. 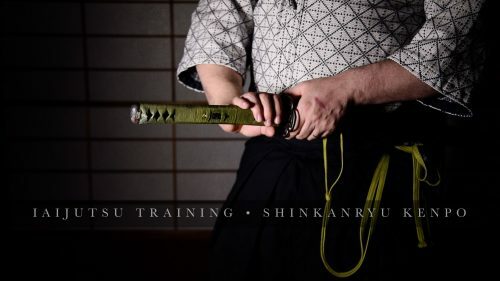 Shinkan-ryū Kenpō's iaijutsu is concerned less with looking perfect and is more intent on being true to its original nature of sword fighting methods. In Shinkan-ryū Kenpō there are many forms and levels of interesting iaijutsu techniques.